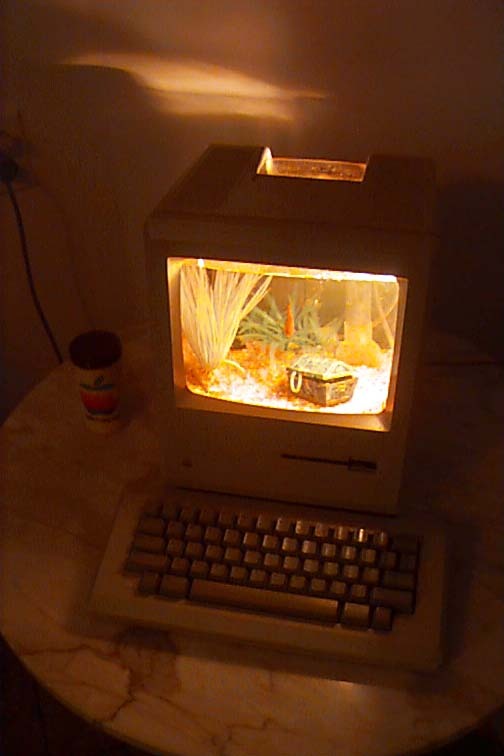 Why would anyone want to turn their old Mac into an aquarium? Well, if you're like me, it's because you think those old one- piece "cute Macs" from the 80s are pretty cool looking, and you want an excuse to keep one around. Especially if you already have a few modern Macs or PCs around the house. My first thoughts were that I could have turned my Mac into a dedicated email terminal or recipe database or some such thing, but that wasn't very exciting. 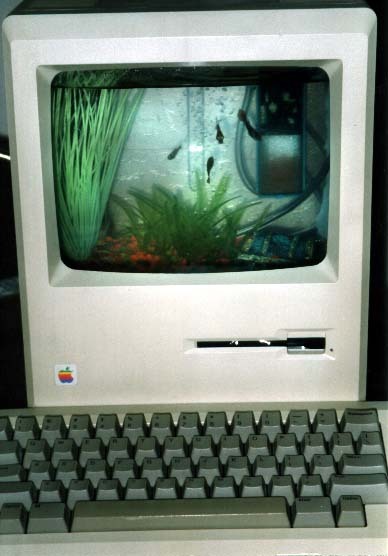 Then the idea hit me - turn my Mac into an aquarium! How did this great idea come to me? I read about it on the Net, of course! These custom conversions, or "MacQuariums" as those of us in the know like to call them are the ultimate upgrade. 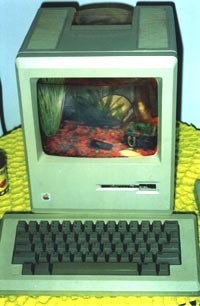 Your tired old Mac Plus will now feature true-colour 3D graphics. Fish are, after all, true-colour and 3D. The video will feature guaranteed flicker-free images and the only refresh rate you need to worry about is how often you'll change the water. In the end, you will have the ultimate screen saver! And lets talk security, I'd like to see some pasty-faced pudgy kid hack into THIS system! He'd need a fishing line and a key to your house. Of course, there is one more small issue - building the darn thing! This is where both the fun and frustration begin. The best way to begin is to read what others have already done. Not only are you saving yourself from reinventing the wheel, but you can then stand on the shoulders of others before you - meaning you can make yours even better than theirs. 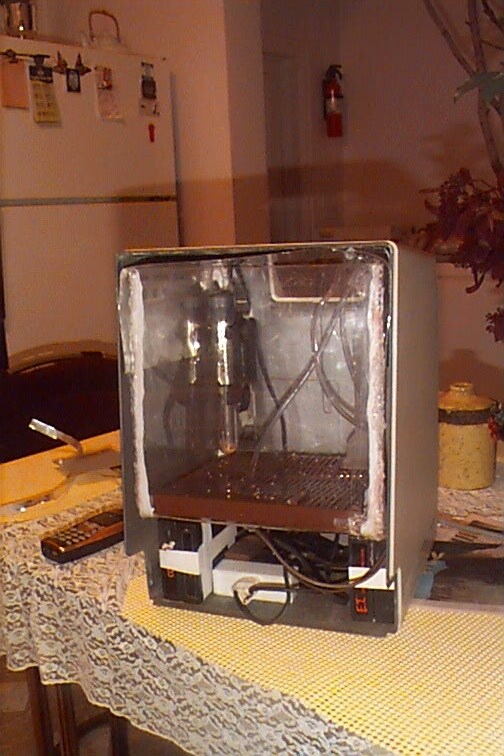 So, in the interest of saving you hours of grief and maximizing your enjoyment, I present to you, without further adieu, how I built my cooler-then-cool MacQuarium. 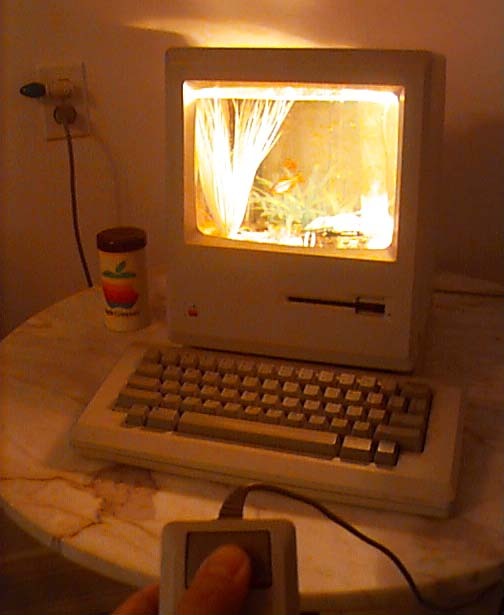 The first thing I did was search for an original 128K Mac. Although I already had a Mac Plus, I had read that the original Macs had the designers' names embossed on the inside of the case. That would look pretty snazzy as the backdrop for the aquarium I thought. In fact, it's pretty darn perfect when you think about it - you want the MacQuarium to serve as a conversation piece - and secret writings found on the insides of a computer, where almost no one would ever think to look are pretty interesting. 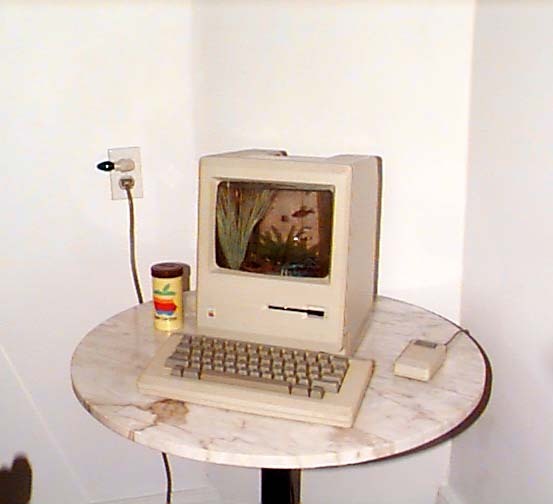 Particularly in these early Macs, which were not designed to be opened up by the user. In fact, you need a pretty funky tool to even get one apart in the first place. Its called a "case cracker" which is in essence a very long and extremely thin screwdriver with a non-standard bit at the end. Check at a Mac repair shop - maybe they'll let you borrow one. Anyway, the point is, since it's the cool design of the Mac that you're showing off with the MacQuarium, what could better accent the decor than the designers signatures themselves. Everyone's there including "Woz" and the infamous "Steven Jobs" himself. Interestingly, you can do a little personality test with these signatures. Where would you expect the gregarious Steve Jobs to sign it? That's right - directly in the center. And the more reserved Steve Wozniak's? His little "Woz" can be found near the bottom right - you have to look hard. Another good reason to seek out an original Mac, aside from the cache of being able to say to people that this is an ORIGINAL Mac - is that the keyboard is proportional to the size of the computer itself. It's small because it lacks a numeric keypad - and so when people like my girlfriend see it, they'll tell you it looks cute. And hey, it takes up less room - and you probably won't be needing a numeric keypad after you've completed the project anyway. 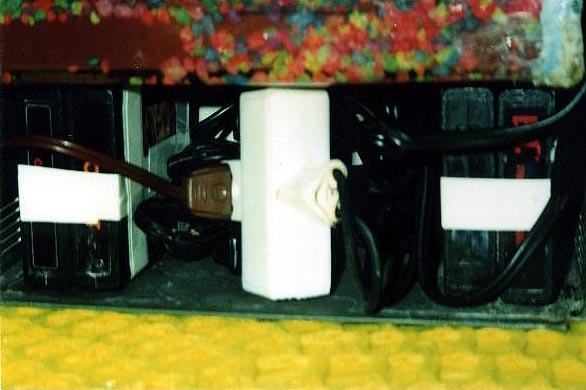 Also, there's a story about this particular keyboard. Apparently, while still at Apple, Steve Jobs saw the aesthetic beauty of the design of this particular peripheral, and fraught vigorously against replacing it with a larger numeric keypad toting keyboard. Unfortunately for him, other powerful people at Apple did not agree - and felt a keyboard with a keypad was necessary to compete with the IMB PC. Well guess what happened, the next version of the Mac came with a keypad on the keyboard and Steve Jobs was ousted. Ironically, Steve Jobs may have had the last laugh as he was brought back to head Apple once again some 15 years later. And what was one of the first things he did? He brought out a cute "one-piece" Mac called the iMac - aesthetics were back again. Of course, this time the keyboard DID have a keypad. But this time, the wider keyboard was proportional to the wider iMac, and so harmony was restored and all was good in the land of Apple.. 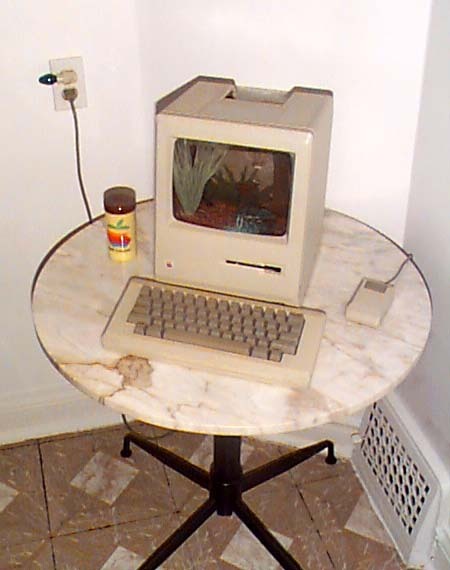 I found my 128K Mac at a store selling various junk such as broken sewing machines, paintings of dogs playing poker and lots and lots of ashtrays. The Mac was dead, just a black screen when it was turned on, but the case looked good - and that was all that mattered anyway. Even better, it meant it would be cheap - $8 if I remember correctly. And it came with the original small proportional keyboard too. 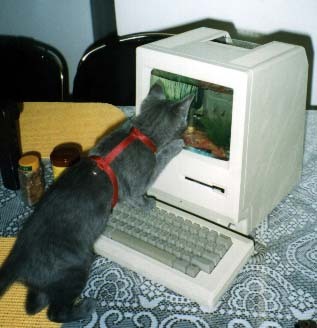 But no mouse. 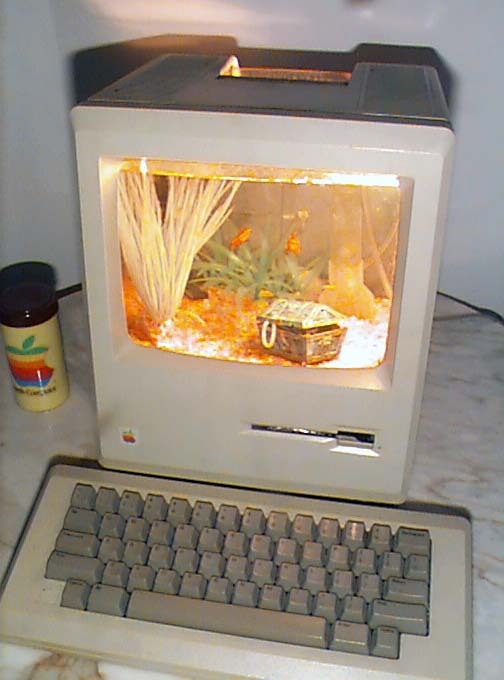 You really don't need either a mouse or a keyboard for a MacQuarium, but it does complete the look, and as you will see later, can actually be used to control things in your little fish world. Now, the instructions I've come across on the Net usually involve cutting and handling sharp pieces of glass to build the tank. I found this to be just a little too dangerous for my liking, especially when one particularly humourous set of directions included the step "apply pressure to the wound", Hey, there's always a bit of truth in every joke - so I stayed away. I like that my fingers help me to count to ten, and I was planning on keeping things that way. So, instead of glass, I thought something like Plexiglas might work well. I looked around and found some large sheets of transparent Lexan at my neighbourhood surplus store for a very good price. It wasn't quite Plexiglas, but that didn't concern me. It was light, transparent and cheap. So, Lexan it was going to be. Turns out Lexan is the same material CDs are made from. It also has the interesting property of being bullet proof. Man, these are going to be some safe fish! 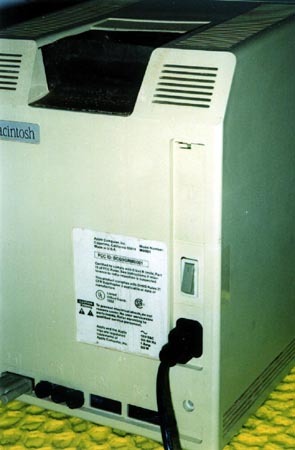 It also made me think that making a bullet proof vest out of old AOL CDROMs would be an interesting project. [Note, my lawyer friend tells me that I should tell you not to actually try this] But I'm not going to be the one try it. Hallelujah, I found the signatures! Cool. I even recognized some aside from the 2 Steves. They were subtle though. Although embossed, they didn't really "stand out". So I had an idea. The inside of the case was a dull grey, but would be much cooler if it were the shiny version of grey, namely silver. And I had a can of silver spray paint around so I was set. A few well-aimed spritzes later, it began to look pretty good. Obviously I was fairly confident this project was going to work - because I should really have left little touches like that for the end, in case it turned out to be a waste of time. Oh well, call me an optimist. 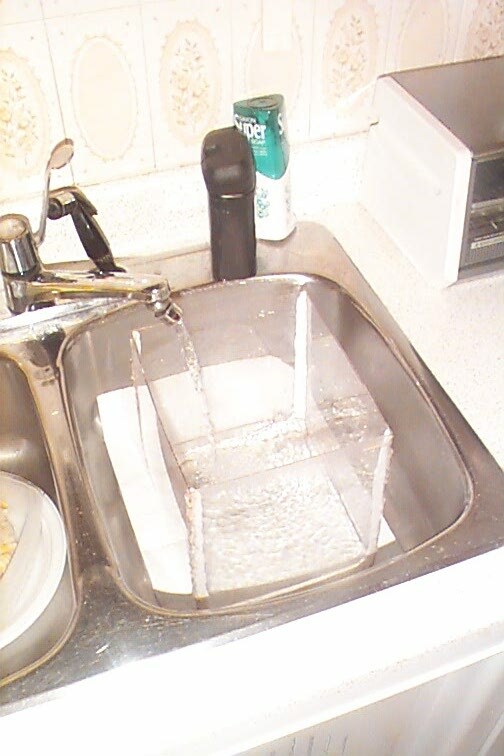 Next point to consider was how in heck was I going to pour water into the thing. The top a Mac has no hole! 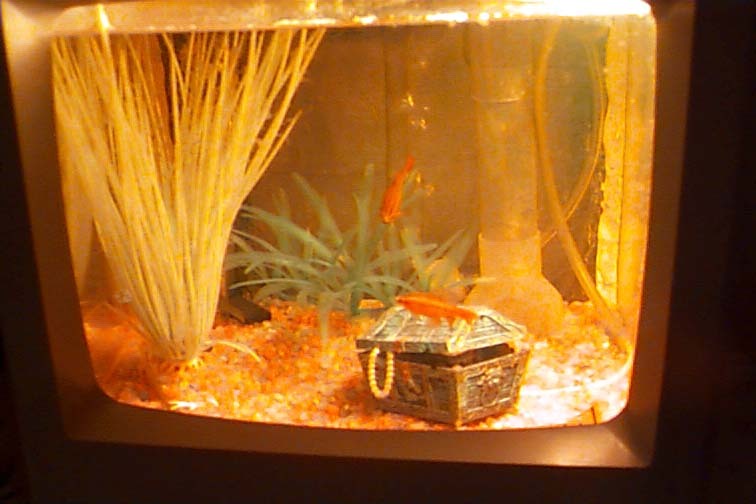 Mine had some ventilation openings, but I didn't think I'd be too successful trying to get my fish in through there. Well, it had no hole, but what it did have was a recessed built-in handle. This handle when cut away would result in a nice sized opening on the top of the Mac which ends up looking like it was designed that way in the first place. Don't believe me? Check out the pics. I got a small saw from the tool shed and sawed away, I made a good hole. At this point I needed to make the tank which would actually hold the water (and fish). 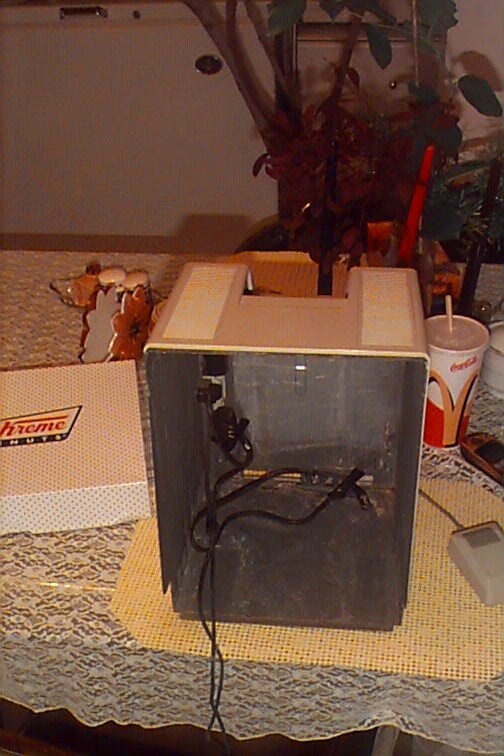 I toyed with the idea of somehow waterproofing the whole case thereby avoiding the hassle of making a tank at all. But then I realized it wasn't practical. 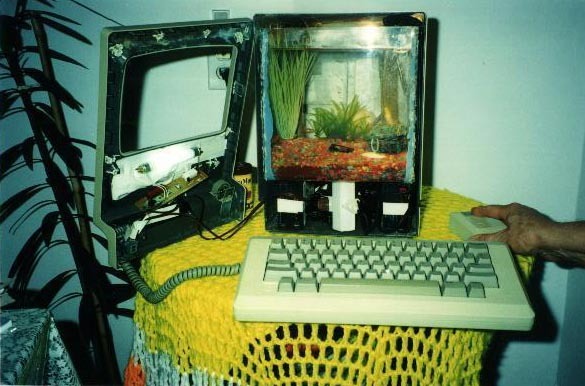 I'd still need to make part of a tank for the screen anyway. And there'd be no room on the inside for the pump and light electronics etc. It would be much neater to house these inside the base of the Mac. 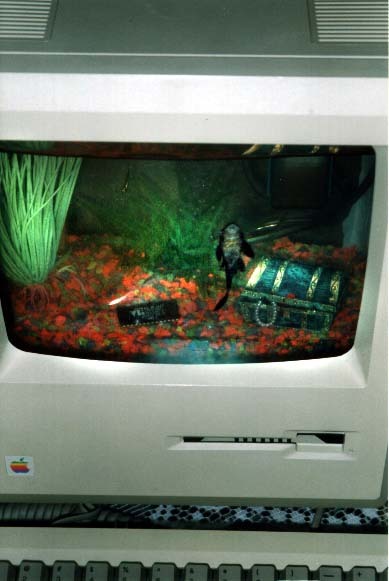 The only thing I wanted coming out of the MacQuarium would be the power cord. 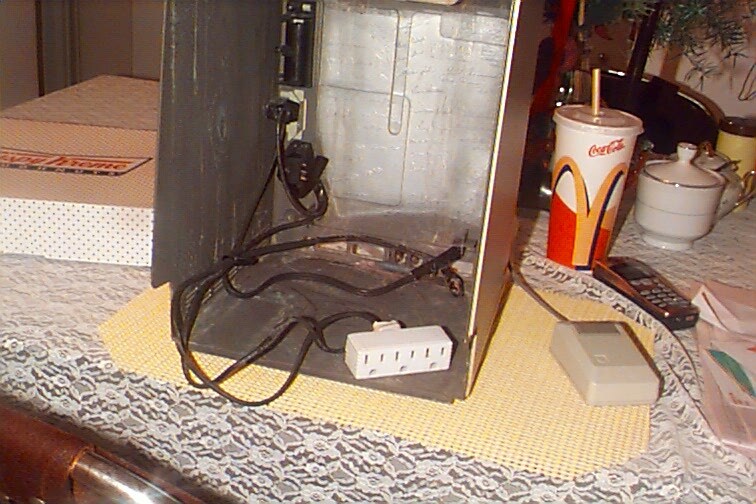 I didn't want air tubes, pumps, lights, or extra power cords spoiling the illusion that this was a Mac. And the only way I was going to make room in the case was to build a small tank that would fill the upper area of the Mac only. Fortunately, this is where the picture tube normally is - so it's a natural location. And yes, this involves more work, but I'm a perfectionist and I believe a job is only worth doing if it's done well. The Tank. This is easily the most difficult part to construct. I knew this, so I took some measurements and went shopping around for a ready made tank that could be used instead. If I could find such a tank, there would be little risk of leaks and it would save me some time. It didn't have to be an exact fit - just big enough to fill the screen space, but smaller than the inside of the shell of the Mac. Well, maybe this exists, but I sure couldn't find it. So I was on my own - I had to make it myself. But while at the pet store, I had a chance to buy some gravel and fake plastic plants. One of them even glowed in the dark - how could I NOT buy it. And so home I went to contemplate my sheet of transparent Lexan. Now, where were we? Oh yes. Don't sue me! What's with you people? Look, this project involves electricity, water, sharp objects and maybe even fish that bite - all dangerous stuff - particularly when you combine them. Got that? OK. Let's move on. So, now I had 3 pieces of Lexan in front of me. Now I needed to bend the long one into a giant letter "U". I got my heat gun [caution, heat guns have been known to make things hot] and proceeded to bend the plastic sheet into shape. I merely applied heat to the section I wished to bend, and in a few seconds, the Lexan gets warm enough to easily bend and so I bent it. It worked pretty well. 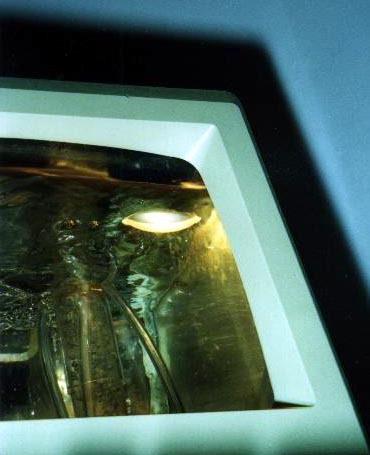 The only point to note is that since the front of the Mac slopes slightly, one must also similarly slope the front of the tank. Well, you do if you want it to look good anyway. And because of this, the side pieces need to be a little lop sided to fit properly too. Hold the pieces together to see if they line up. I doubt they will. Mine didn't anyway. Bend and cut until they do. There, now all you have to do is join them together. Well, let me just say this is the biggest understatement of the article. "Just" joining them together also means joining them so that they don't come apart from the pressure of holding gallons water, and it means it needs to be absolutely water proof. And it needs to continue to be water proof after jostling it AND it still has to look good when you're done! To put it mildly, it wasn't easy. I first bought some aquarium sealant. It's this tranparent silicone based stuff in a tube. It didn't work. 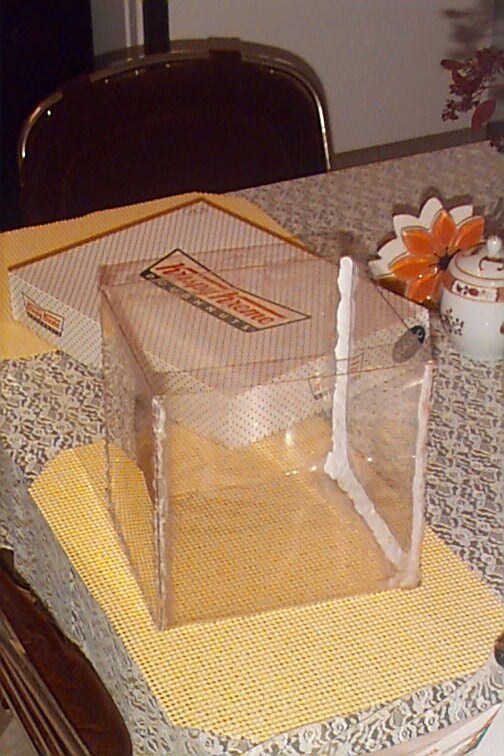 It was made to seal glass aquariums, and just wouldn't stick to my Lexan. Undaunted, I used a glue gun [careful] and thought I had the problem licked. But surprise surprise, it also wasn't up to the task. When I filled the tank and it bagan leaking almost immediately. I decided it just needed more - and so I put gobs of it on, and no change - still leaked almost instantly. It held so loosly that I was able to just peel away all the glue to get ready for my next try. My next attempt involved - Super glue! That's gotta work. Well, not really. It did hold the pieces together somewhat, but unless you have a perfect, and I mean perfect fit between the pieces, it leaks. To make matters worse, just wiggling the tank a bit made it come apart. Back to square one. Water soluble kids' glue? What was I thinking. Did it Work? No. Well, I'm not a quitter, I was definitely going to use the Lexan and have a bullet-proof fish tank and that was that. Where there's a will there's a way. The more obvious potential solutions just weren't getting me anywhere - so, it was time to think outside of the box, so to speak. Think Different some would say. It came to me. I'll melt those suckers together! Now how am I going to do that? I thought. Microwave it? Use a lighter? An iron? I ended up using a soldering iron [again, it's hot - so don't actually use one yourself] I painstakingly melted the 3 sections together inch by inch, centimetre by centimetre.. Success! This was a solid piece of work when I was done. I could drop this tank on the floor and it would just laugh as it bounced around. 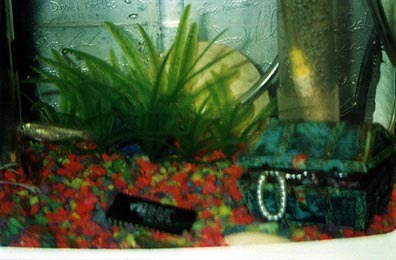 It was an indestructible bullet proof fish tank. Pity that it leaked though. I couldn't believe it. It leaked. 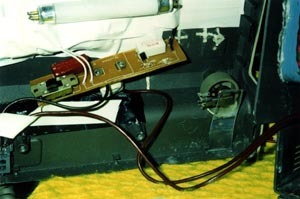 How could it leak - I went over every little bit of every edge with my soldering iron. But leak it did. Well, I thought to myself - at least I'm closer. At least the sides are staying together. Well, that led me to a new train of thought. I now just had to seal it - and it would not have to be so strong a sealant as to keep the tank together. I had some plastercine around - so I rolled it up into thin little snakes that I pressed into all the inside seams of the tank. The pressure of the water would just make the seal tighter, I figured, by pressing the plastercine tightly into the seams. 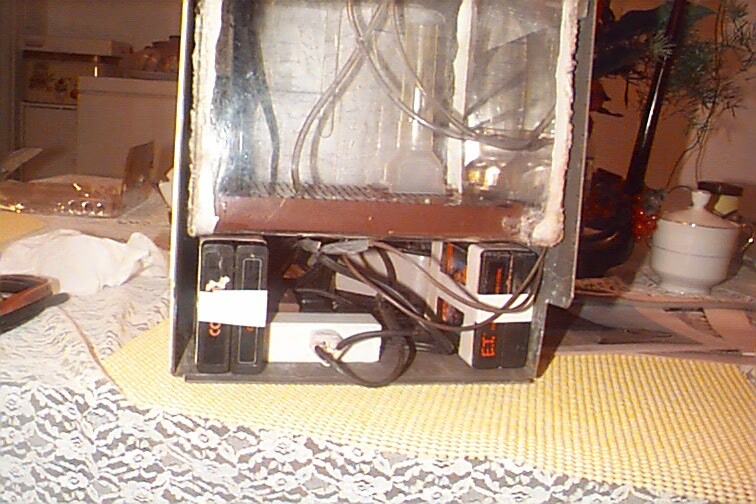 Now, stick your cool Lexan tank inside the case, put the front face of the Mac back on. Does it fit? Good. Now you need to place it on something so that it is at screen level, and you have space at the base for your pump and things. I used 4 Atari 2600 cartridges that to do the job. 2 on each side with the middle open for unsightly wires tubes and pump. Now after you've propped up the tank, put the front cover of the Mac case back on once again. Hopefully it still fits. If not, boy, you've got a lot of work to do! Mine still fit at this point, thank goodness. Well, whether it fit or not, it might be time for a break at this point. Have a nap, you've earned it. Refreshed? OK, we're off to the store again. We need more stuff. We need an air pump as I've mentioned a few times, a length of air hose, a water heater if you want to have anything more interesting than goldfish, and a treasure chest. You gotta have a treasure chest. Since I already picked up the gravel and plants, that was done. 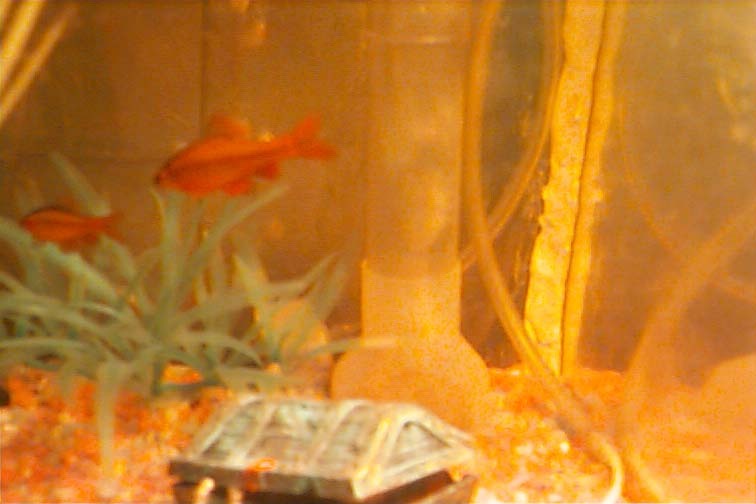 We also need a filter, fish food, and, of course, fish. Lets talk about filters - get the under gravel kind. The replicable cartridge type is like an inkjet printer - you're always buying expensive new cartridges. And even worse, it looks rather ugly when it starts getting dirty. I did this, but then switch to the under gravel kind and was a LOT happier. If you're not familiar, it basically turns the whole gravel floor of the aquarium into a filter that magically only very rarely needs cleaning - something to do with bacteria and such - very complicated - look it up. Plus, there's a cool "bubble tube" that makes it work - and it happens to look pretty nifty. In my case, I bought an under gravel kit that came in 2 modular pieces. In a normal rectangular aquarium, you'd stick the 2 square pieces end to end to cover the floor of the aquarium. Well, it just so happened that using just one of these square pieces almost perfectly fit the floor of my MacQuarium tank. Lucky break there. Then, after you've attached the pieces as the instructions tell you to - you just pour the gravel over it and you're in business. Now, stick the heater in the tank. I keep mine at one of the back corners. Put the pump in the base and attach it to the 3 way valve. What 3 way valve? The one I forgot to mention above - get one of these and you'll be able to power 3 air-powered devices - the filter, the treasure chest and perhaps an air stone like I have. But the treasure chest is mandatory. Gotta have a treasure chest. Then wire it all up. I'd tell you how, but I'm told you'd electrocute yourself and sue me. Well, perhaps I'll add that part later if there is sufficient interest. Basically, what you want in the end is to be able to use the Mac on/off switch at the back to turn your system on and off. A light is highly recommended, as the MacQuarium only has ambient room light coming in from the front of the tank, and a little from the hole in the top. That's 3 less sides getting light than a typical aquarium. I wired an internal light to a key on the keyboard which turns it off and on. This is rather complicated and i'll save that for a future article. Oh, and the mouse? I eventually found an original blocky one at a computer store to complete my system. After all, what's a Mac without a mouse? 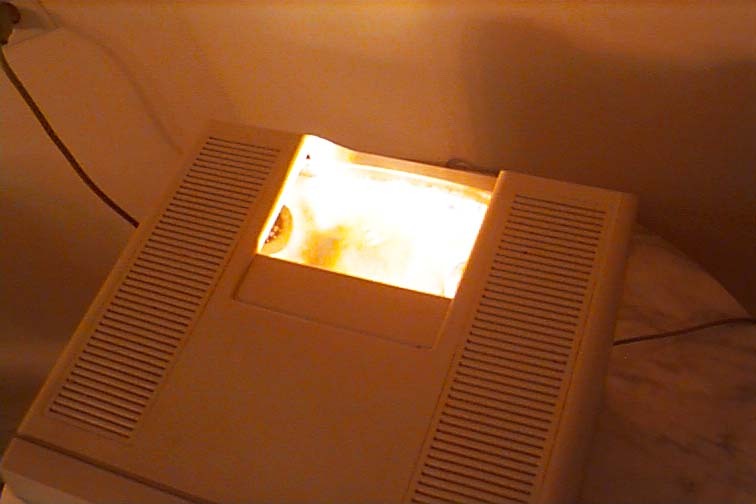 I rigged the mouse button to turn on a brighter halogen light. I only use it for short periods since it's rather a hot light and I don't want fish soup. But the colours are so vivid and clear when it's on. The reason I chose to use the mouse button is because it's cool to have the mouse do something, and, more practically you'll never accidentally leave it on and cook your fish because as soon as you let go, the button releases and the light turns off. I did this once with my Sea Monkeys. It wasn't pretty. I have it all on video, quite sad really. 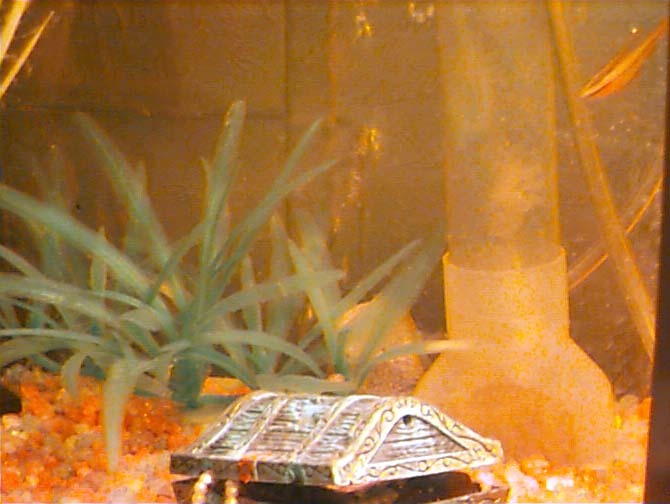 I was experimenting with the close-up function of my camcorder, and thought I'd get a nice video of my Sea Monkeys frolicking around. I was even watching them at the time of their untimely demise. They looked fine, just swimming away, and then suddenly, in a span of a few seconds, they all just stopped moving. If only they could scream, or at least swim around a little faster so I knew something was up. Oh well, Sea Monkeys aren't that bright - that's why they sell them as fish food. As you can see, there is a LOT more I can write, but this should be enough to get you "wet" your appetite. 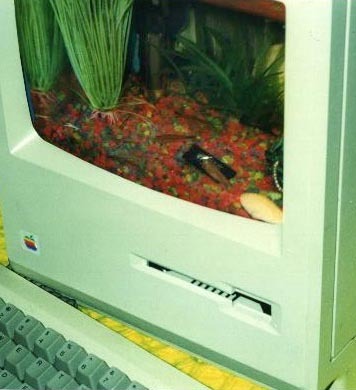 So, get going and build your own MacQuarium. And drop me a line, I'd love to hear from you.